So yesterday, I noticed a mistake and tried to correct it. That's what copy editors do. Usually, it ends there. Not this time. And other websites wanted to run the story – and my exclusive photo of the misspelled star. Some, properly, asked for permission; others (naughty, naughty!) just went ahead and reposted the pic, sometimes but not always including a photo credit. I spent half of my afternoon calling and emailing various CNN executives, trying to make sure the responsible journalists could run their stories. The less scrupulous ones, of course, already had. "Hi, David! 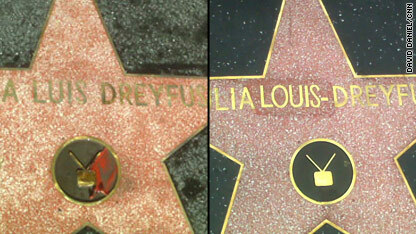 It's Julia Louis-Dreyfus calling, and I can't believe that you were the one who noticed this misspelling today. I am just blown away by this, and I'm so happy that you got the picture of it! This was just forwarded to me. I'm beside myself! And I so wish they'd left it down, wrong, because it would have been a fabulous, fabulous story like that. But it already is a good story, and thank you so much for noticing the error, and taking a photo of it. Give me a call if you can... I'd love to talk to you!" After reeling for a minute, I called the number she'd given (a publicist), and soon I was chatting with Louis-Dreyfus. Her voice had that unmistakably enthusiastic Elaine Benes tone, almost giddy – I half-expected her to tell me "Get OUT!" (Hey, I'm just delighted she found the blog "call-worthy.") She repeated how amusing she found the whole turn of events, and how she wished they'd left the mistaken spelling for the ceremony: "I'd have taken a Sharpie and fixed it myself, right there!" Great story. What agency can the legit media contact to buy the photo? This is just the kind of thing that would have happened to the "Elaine" character Julia Louis-Dreyfus portrayed... would have made a great storyline! She seems to be getting better looking every year too. Seems like she would be fun to hang out with....And go on a three week bender in Cabo with. Where the white women @? Rebecca the proofreader has another typo: the word "to" is left out of the third line: "We all went *to* school." Had to point it out. 🙂 But I agree with her message 100%. I got a turtle head poking out. Fat basterd from spy whom shagged she. Please analyze that! this is a non-story. the blackberry photo has poor composition. Can you believe what poopers some people are? They write a comment telling us how stoopid the walk of fame is, or how ridiculous celebrity is. Man, what dour people! Loosen up buds, and have a little fun in life. And if stuff like this bugs you, well, take a minute, be bugged, and just move along. Julia's a doll and this guy wrote a cute article. What more do we need to know? So they got the spelling right, but the lettering looks terrible. Its a hideous job. The spacing of the lettering is off, and the "O" looks oblong, like a 3rd grader inserted it. Julia, Congratulations on your star! Sorry could not be there for the unveiling ceremony. I have loved your work and would have enjoyed seeing you make the correction with a sharpie! Good luck on your future projects! You must be so proud to correct such a grievious error. The world is a much better place now that a super rich star can sleep better at night. With all of the worlds problems, this story is worth engaging. Red Dawn... That's what I thought too! It seems a bit squished to me. . .
Why is the "S" on a diet? Her last name is spelled correctly-the light makes the R look like a P.
And why can't some of you people just enjoy a happy moment instead of analyzing or griping–if you "don't give a shat" then why did you feel the need to comment–evidently you gave a shat long enough to make sure you put your 2 cents in–or you needed to feel important for 5 minutes yourself. Sometimes people need a lighthearted moment to keep all the terrible and depressing things from consuming them-so get over YOURSELF. Great story! This is the kind of typo that I publish at shamefultypos.com – may I have permission to post a copy of the photo there? Another Lynn Truss moment - good catch! You'll have your star some day on the copy editors walk of fame. I'm sure there is one somewhere - perhaps at the corner of Oxford and Websters?. I heard blogs were getting nasty, but wow! Folks, lighten up!!!!! Fun story! Not so fun comments, though. Major buzzkill for the most part. Shelly, you're so silly. Troy, you are funny! Too bad Julia didn't find out in time to have a say in the matter! It would have made her star a "must see" attraction if they had made a bit out of it. Did you notice that her last name was spelled wrong on the new star? DP instead of DR. Can't get out there with a camera, though. I'm disappointed with CNN. Some reporter got to talk to a famous person and made a big story about it. Wow. I'm not impressed. So do you think you could ask Julia if she could fix me up with Marisa Tomei? I really hope they plan on replacing the whole star. That temporary fix is the wrong stone color, angled a bit, and the letters look crushed compared to everything else. It's a real mess. Funny, and probably appropriate for this comedic star. But it needs to be fixed for good. What a class act Julia is! Other celebrities would have had a cow over the fact that their name was misspelled – let alone on Hollywood Blvd. She rolled with the punches and found humor in it instead of whining and complaining. Aaaarghh isn't a word by the way. I should have made my previous post funny. Guess my assumption that the people who claim to proofread and monitor other peoples grammar usage are bad at grammar too. You claim to be a proofreader. I'm a comedian, but I'm not good at my job either. Nice work on DOING YOUR JOB. Kudos for finding the "typo!" As a proofreader, I am finding it more and more aggravating to see all of the bad grammar/spelling out there these days. People, we all went school and learned the basic rules of English when we were kids–didn't any of that sink in? We all want the world to look up to us and expect immigrants to our country to learn English, but how can we expect so much from others if we don't do the same–we look like complete ignoramuses when can't even spell in our own language! For example: an apostrophe only goes in a word if it's a contraction or the word is possessive–ie. the dog wagged its tail NOT the dog wagged it's tail. I saw a sign today on the way home from work that said, "Video's for Sale Open Saturday's and Sunday's. CRINGE!!! Okay, end of Grammar Rant...time to go back on the Xanax, methinks. The "S" not only looks like an anorexic font next to the other letters in the "right" picture, it looks like it wants to make a break away. Now it looks like a corrected tombstone, what a lousy patchjob! Sweet of her to call you. I was wondering why she went from a sculptural tv set to a flat one–are they "recycling" stars–is that sculptural one an older version? "The only thing worse than people giddy over 15 minutes of fame is people who try to make an actual *news item* out of it. So you caught a misspelling of a star's name and that star contacted you. Oh, and then you had to go blog about it on CNN, because CNN is quickly becoming a farce of a news source and more of an interactive, reality news game. Just what the world needs–more people who take themselves far too seriously." Sal, you took the time to read the latest post on the CNN "entertainment" blog. And you have taken the time to comment on it! Embrace your inner gossip-monger! The only thing worse than people giddy over 15 minutes of fame is people who try to make an actual *news item* out of it. So you caught a misspelling of a star's name and that star contacted you. Oh, and then you had to go blog about it on CNN, because CNN is quickly becoming a farce of a news source and more of an interactive, reality news game. Just what the world needs–more people who take themselves far too seriously. Thanks for a fun story in an otherwise bleak newsweek. I agree with Susan. I find the whole star on the walkway thing pointness. Sure to me it means you're well-known, but really if it was anywhere else than Hollywood I'm sure it would be a put down. Correction to the above comment!! Speaking of "copy editing," there is a misspelling in this article, and I'm not talking about a star on the Walk of Fame. The second paragraph, first sentence: "After the fixed..."
I'd never even heard of her before. Sure, I've seen Seinfeld, and assume from the other comments that she's the female lead in the series ... but if it hadn't been for the story, I would have gone through life blissfully unaware of her real name. This is a great little bit of news. Amazing that she called! That's so cool..glad you spotted the error – definitely something you'll always remember. I bet you ran spell check on your post 200 times to make sure you didn't screw up on your own criticism. It was 4 hours before the ceremony Rod. JULIA , SUCH A FANTASTIC REACTION. THAT IS WHY I AM IN LOVE WITH HER. At least the star didn't say "Cartwright! Cartwright!" Did no one notice this during the ceremony? Talk about the blindness of stardom. Let's all do the Elaine happy-dance to celebrate this. Cute story – made me smile! Congrats to you! What talented actor would want a star on the HWF these days? It has nothing to do with talent anymore. Even Vanna White has one. Um. I absolutely see the misspelled name in the first picture but has anyone else commented on big smear of blood or ketchup (I hope it's ketchup!) on the first picture? Where the heck is Julia's star – is in a bad neighborhood or in front of a Hot Dog stand? The red substance appeared to be wax or something similar, left over from the substance that had protected the star before its unveiling. The workmen were in the process of cleaning the star and the area around it when I took the photo, but they hadn't finished. No blood, no ketchup. David, you make us all proud. Now, go and proofread the rest of Hollywood Blvd. This is a great story! As a huge Seinfeld devotee and a longtime copy editor, I got a huge kick out of reading this piece. How wonderful that Julia Louis-Dreyfus is as down to earth as she seems to be in the Seinfeld DVD extras!